In winter 3 coach companies run between New Chitose Airport and Hirafu Welcome Center, transfer takes about 3 hours. You need booking and checking time schedule and price to each coach company. *The transfer depend on the weather and road condition. *We require to notice your arrival time until 14 days before check-in. *Requiring additional 3,000 JPY for pick-up service and check-in after 6pm. *Our staff wait for you at Hirafu Welcome Center. You can chill out within 5 minutes from there. ※ If you click the blue arrow to open the booking page of each shuttle bus. Transfer takes about 2 hours from New Chitose Airport to JR Kutchancho station. We offer free pick up service from the station, our stuff wait for you with Bliss car. 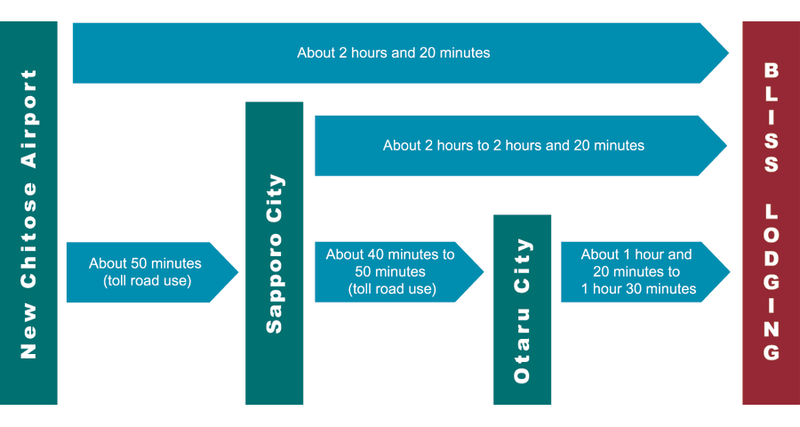 It takes about 2.5 hours from New Chitose Airport and Sapporo city to Bliss Lodging. We recommend booking before you arrive, if you need to rent a car in Sapporo city, Otaru and New Chitose Airport. *Driving time depend on weather and road condition. There are private transfer companies in Niseko, it is recommended to the person who would like to spend a transfer comfortably. *The transfer depends on season, weather and road condition.